The turntables from Music Hall have long ceased to be an insider’s tip and have earned an excellent reputation among the relevant circles. 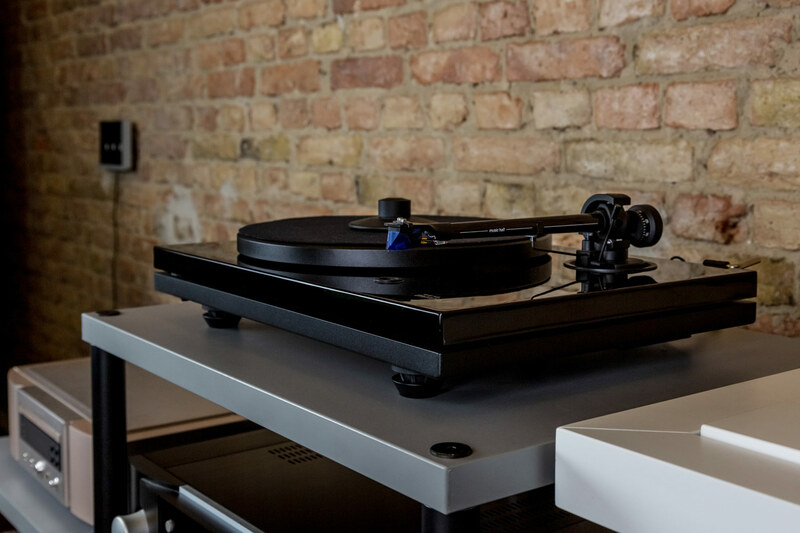 Therefore, we are very happy to have the record players in our program now and would like to introduce them, as well as the manufacturer itself, in more detail here. After some rather unlucky first attempts on the US-American HiFi market at the end of the ’70s and beginning of the ’80s, Roy Hall, born in Scotland, succeeds in his first coup by a more than lucky coincidence: the takeover of the US distribution for the British manufacturer Creek Audio. This not only ensured Hall’s questionable continued existence as an entrepreneur but also survived a bold idea from the early phase. While the whole world relied on the newly introduced CD technology, Hall decided in the mid-1980s to continue selling turntables. In the end, he laid the foundation stone for his extremely popular, own record player models, which, however, were to see the light of day much later, for the first time in 1998. Over 20 years and a few model series later, we now have two devices from the Music Hall range in our demonstration and will take a closer look at them in the following. First, we stick to the mmf 5.3, which can also be seen in the photos, and then we highlight the improvements that make the mmf 9.3 even more elaborately manufactured. Let’s start with the foundation and focus on the eye-catching SPIT frame construction (SPIT stands for Split Plinth Isolation Technology) of the mmf 5.3, which consists of two decoupled plates. The lower frame with its three height-adjustable feet forms the base to which both the terminal with the obligatory connections – stereo cinch output and ground cable – and the motor are attached. The latter is characterized by its particularly quiet running, which is ensured, among other things, by the fact that the supply voltage is regenerated by means of a sinusoidal generator and is therefore independent of the mains supply. To switch between the typical rotational speeds of 33 1/3 rpm and 45 rpm, the drive has two grooves. The speed is therefore adjusted by manually turning the belt, which is flat to ensure clean and effective transmission of movement to the platter. We are thus switching to the upper frame of the sandwich construction, which rests on six elements made of viscoelastic material – all other components are fastened on this level. If we follow the drive belt, it leads to the turntable or, in the case of the Music Hall mmf 5.3, first to the sub-table underneath, which rotates in a sintered bronze bearing. On top is the actual turntable made of cast aluminum, which is equipped ex works with a black felt mat and a record clamp that stabilizes the record. Last but not least the tonearm and the pickup system have to be mentioned. The conically shaped 9-inch carbon tonearm is gimbal mounted, made of one piece and has extremely high stiffness so that the forces occurring during the scanning can have as little influence as possible. In addition, both the vertical and horizontal scanning angles can be adjusted as required. 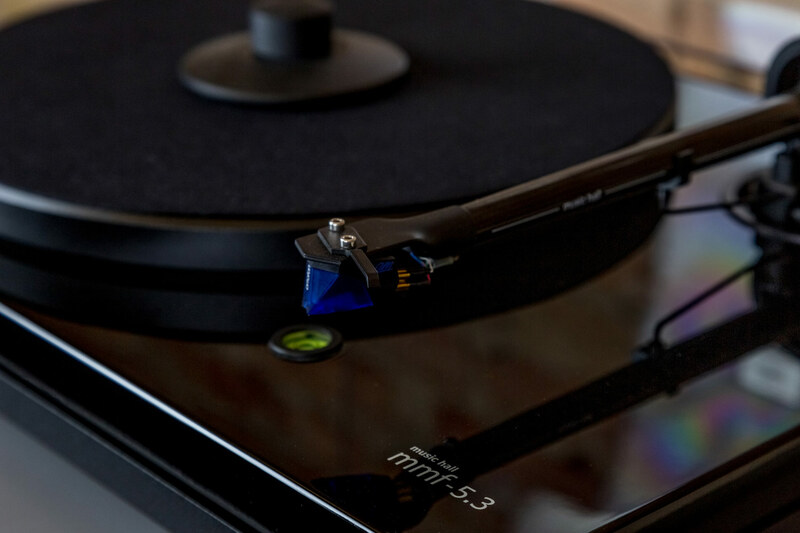 A high-quality Ortofon 2M Blue pickup system is pre-assembled on the headshell as standard, rounding off the extraordinarily carefully designed mmf 5.3. Now let’s take a look at the Music Hall mmf 9.3, which basically refines the concept of the mmf 5.3 and pushes it to the extreme to get the most out of the recording medium. First, the frame was extended by a third layer, the middle layer serves exclusively as a buffer and ensures even better decoupling of the sensitive components. The connection terminal and the electronic speed control of the motor are also attached to the lower plate, which is fitted with spikes as standard. The engine itself of the mmf 9.3 is completely outsourced and consists of two parts: a heavy, damped base and the actual engine, which works according to the principle described above, but also has a nice extra feature: Until the set speed is actually reached, the LED in the motor housing flashes and then switches to continuous operation to signal a stable speed. 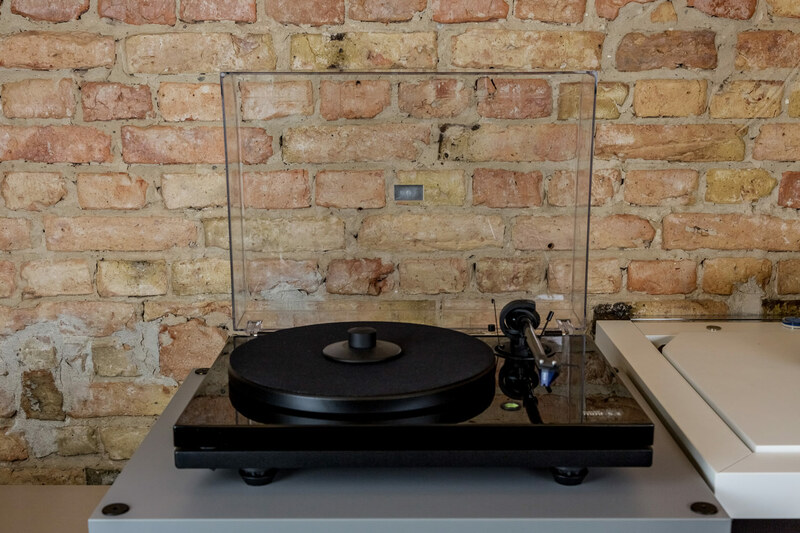 The turntable is made of acrylic and allows a record to be put on without an underlying felt mat. It runs on an inverse bearing, i.e. the bearing bush made of sintered bronze is worked into the turntable and rotates on a polished ceramic ball. Accordingly, the drive belt of the mmf 9.3 runs around the outside of the platter. In order to determine the correct distance between the motor and the turntable, a small plastic template is included – a clever solution. Last but not least, of course, the tonearm has also been upgraded. The Music Hall mmf 9.3 comes with an exquisite gold ring Eroica LX pickup, which is an excellent addition to the more elaborate construction of the mmf 9.3. Basically, everything is said. 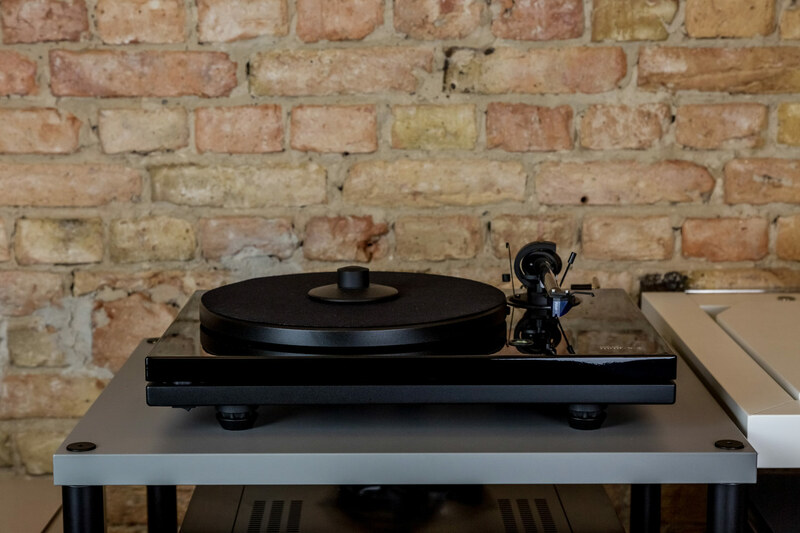 The Music Hall models mmf 5.3 and mmf 9.3 are two outstanding turntables, each offering an absolutely fair price-performance ratio in its class. More information about Roy Hall’s philosophy regarding pricing can also be found in the interview linked above, we leave it at the hint that his remarks are not completely youth-free and conclude with regard to the record players as follows: Absolutely test it!